I haven’t done a news roundup in a few weeks. It’s time to get back on schedule. —Newsru.com is reporting that an anti-fascist rally in front of the Moscow city hall was broken up by OMON on Sunday. About two hundred protesters gathered in response to the rise in nationalism and racism. Shortly after they gathered, buses carrying OMON officers arrived. The officers charged the crowd arresting participants. One woman was taken to the hospital with injuries after an officer hit her over the head. Sunday’s protest was in response to the nationalist rallies held on the first celebration of “Unity Day” on November 4. The holiday, which celebrates the liberation of Moscow from Poland in the 16th century, was commemorated by the ultranationalist Eurasian Youth League with a rally 1000 strong to denounce the influx of immigrants into Russia. —The Moscow Times reports that the office of the National Bolshevik Party was raided by police on Thursday. Last week the Russian Supreme Court liquidated the NBP, overturning its own earlier ruling upholding their right to operate. NBP spokesperson, Alexander Averin told Ekho Moskvy that ten NBP members chained themselves to a radiator to protest the eviction. This made them easy targets for police to beat them. “One of the priority tasks right now, as I already said, is to identify and eliminate the funding sources and to cut off the funding channels of terrorist organizations and bandit formations. Both our own and foreign experience demonstrates that one of the key conditions for effective enforcement work in combating terrorism is that the special services and law enforcement agencies should be endowed with the relevant procedural powers with regard to monitoring of financial flows, freezing and seizing suspect accounts, and compelling financial and credit organizations to collaborate with them. For example, in the United States the Patriot Act introduced amendments to the laws on banking and financial confidentiality that make it possible to obtain relevant information from banking and financial institutions when international terrorism is involved. Putin was more measured in his remarks on the bill. Though while agreeing that Russia needs such organizations he added, “The ongoing funding of political activity in Russia from abroad, I think, must be on the state’s radar screen, especially if this funding … comes through the state channels of other countries, and … organizations operating here and involved in political activity are, in essence, used as foreign policy instruments by other states.” Only time will tell on this. But the bill is sure to send a chilling effect through NGOs, especially ones like Human Rights Watch and Amnesty International which heave heavy and much needed criticism of the Putin Administration’s policies. To follow developments I urge readers to point their mouse to Radio Free Europe’s special section “The Crisis in Chechnya.” I hope to address the elections more thoroughly in the coming days. —It seems that this is the year of elections in the former Soviet Republics. Azerbaijan held theirs. Chechnya is voting now. On December 4 Kazakhs will go to the polls to elect a new president. There is little doubt, with all the state oppression, manipulation, and other shenanigans, that current President Nursultan Nazarbaev will win. There are signs that the Kazakh elections are trying to appear legitimate. Last week candidates participated without Nazarbaev in a televised debate. The participants included Zharmakhan Tuyakbai, from For a Just Kazakhstan; Alikhan Baimenov, from Ak Zhol (Bright Path); Erasyl Abylkasymov, from the Communist People’s Party of Kazakhstan; and lawyer and environmentalist Mels Eleusizov. Nursaltan did not participate and was on an official visit in Ukraine. Like in all the other former republics, the elections have sparked speculation of a “colored revolution.” The leader of the opposition bloc For a Just Kazakhstan, Zharmakhan Tuyakbai, stated that his bloc “have ever planned or are planning any anti-constitutional actions or measures aimed at destabilizing the situation in the country.” This follows statements by Kazakh security forces warning that they have information that the Opposition is planning such actions and promise that if they do they will be “severely dealt with.” For more information as it develops, Radio Free Europe has set up a special section “Kazakhstan Votes 2005”. To make matters worse for Yushchenko, his administration was full of promise but delivered little by way of domestic reform. His administration was cobbling together of “politicians who came to power were not able to offer a satisfactory socio-political model and, instead, became preoccupied with a banal redistribution of property and influence,” says Yury Boiko, the leader of Ukraine’s Republican Party. “The team that emerged was formed on the sole basis of a disdain for the previous government and the wish to overthrow it. Their business and political interests differed, which took a toll on all the subsequent efforts and reforms.” According to Abelsky such a situation has not squelched speculation of the legitimacy of last year’s elections, and perhaps worse squandered the “vast symbolic potential of an uprising built around declarations of justice and democracy.” Thus the parliamentary elections in March will be a more effective measure of the Orange Revolution successes and failures. 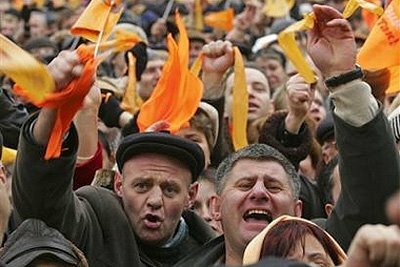 On the Georgian side, Shaun Walker gives his analysis of Georgian-Russian relations two years after Mikheil Saakashvili led protesters in overthrowing Eduard Shevardnadze. While there has been some progress on governmental transparency, Georgia is far from democratic and in fact according to Oksana Antonenko of London’s International Institute for Strategic Studies, “Georgia has not become more democratic. What we’ve seen is the emergence of a very strong, centralized one-party structure, in which the president decides everything and there’s no real opposition.” While relations with the West have improved, those with Russia have gotten colder; so cold Georgia has hinted at pulling out of the CIS all together. Such a move would be an economic disaster for Georgia. Especially in the price of natural gas, who like its Ukrainian counterpart, receives price subsidies from Russia. In all, the reality of the colored revolutions is structured by economics. While Ukraine and Georgia can strive for political and foreign policy independence, their economic dependency on Russia for energy and markets hampers that desire. The champions of revolution who now sit in Kiev and Tbilisi have painfully learned a hard lesson: pro-Western and anti-Russian rhetoric might win you elections, but it won’t make it easy to rule.